347 Anhang I. Matricula universitatis 1663-1668. 361 Anhang II. Album magistrorum artium a. 1391-1620. 478 Anhang III. Ecce matricula alumnorum iuris (de anno 1527-1581). 500 Anhang IV. Catalogus promotorum in iure tam canonico quam civili ab anno 1386-1581. 545 Anhang V. Matricula studiosorum theologiae de anno 1556-1685. 586 Anhang VI. Promotiones factae in facultate theologica ab anno 1404-1686. 607 Anhang VII. 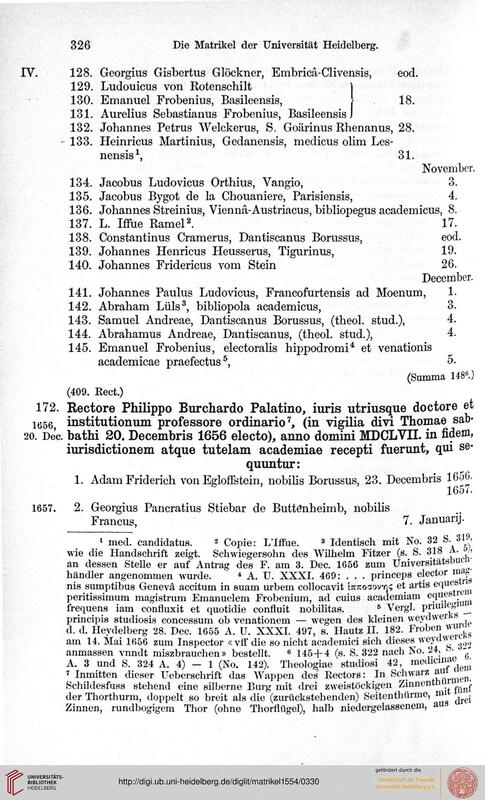 Syllabus rectorum universitatis studii Heidelbergensis ab an. 1386 ad an. 1668. 326 Die Matrikel der Universität Heidelberg. IV. 128. Georgius Gisbertus Glöckner, Embricä-Clivensis, eod. 130. Emanuel Frobenius, Basileensis, \ 18. 132. Johannes Petrus Welckerus, S. Goärinus Rhenanus, 28. 134. Jacobus Ludovicus Orthius, Vangio, 3. 135. Jacobus Bygot de la Chouaniere, Parisiensis, 4. 136. Johannes Streinius, Viennä-Austriacus, bibliopegus academicus, 8. 137. L. Iffue Ramel2. 17. 138. Constantinus Cramerus, Dantiscanus Borussus, eod. 139. Johannes Henricus Heusserus, Tigurinus, 19. 140. Johannes Fridericus vom Stein 26. 141. Johannes Paulus Ludovicus, Francofurtensis ad Moenum, 1. 142. Abraham Luis3, bibliopola academicus, 3. 143. Samuel Andreae, Dantiscanus Borussus, (theol. stud. ), 4. 144. Abrahamus Andreae, Dantiscanus, (theol. stud. ), 4. 1. Adam Friderich von Egloffstein, nobilis Borussus, 23. Decembris 1656.
prineipis studiosis concessum ob venationem — wegen des kleinen wcydwerK.